Nobody knows as much as I do how hectic life can get! On those go-go-go days you will inevitably have sooner or later, it's always nice to have an easy and simple meal planned whether it's a true sit down meal, scarfed down on your way out the door or even taken with you to your destination. The Campbell's Soup brand has come up with an easy alternative for all three of those scenarios; Campbell's GO Soup! A little about the GO line of soups: "Grab Campbell’s Go™ soup the next time you’re on the go! With 6 different flavors you can choose from, you will always have a flavor that will take you on an adventure. Each flavor has its own bold personality to match your mood." The 6 varieties you're able to choose from are definitely something that caught my attention right away; you'll find Moroccan Style Chicken with Chickpeas, Golden Lentil with Madras Curry, Creamy Red Pepper with Smoked Gouda, Coconut Curry with Chicken and Shitake Mushrooms, Chicken & Quinoa with Poblano Chilies, and finally Spicy Chorizo and Pulled Chicken with Black Beans. I really like that Campbell's embraced such bold and unique flavors! According to the dad, he quite enjoyed the soups he tried. "They were flavorful and had a little kick to them," was what he reported back to me. So score one for flavor! *While I understand this is meant 'to go', I was not a fan of microwaving the plastic container which is why you see it being prepared in a glass bowl. There was also no sort of warning or wording to let you know whether the plastic is toxic or not when microwaved. *Being Campbell's, the ingredients weren't the best for you, however that being said they weren't completely horrible like so many other things out there; I was so so on that front. *I was not a fan of the fact that there was no allergy warning label on the product itself. Usually they have to put near or below the ingredient list 'made in a facility that also produces wheat, dairy, blahblahblah,' but there was absolutely nothing. While I unfortunately had mixed emotions about this Campbell's GO soup, the nice thing that I really DID like is if you or your family are on a limited budget, you can make these puppies streeeetch! I had my mom's help with this one; We used the Chicken & Quinoa with Poblano Chilies and put it over a bed of brown rice and steamed up some broccoli to go with it. All in all, we fed a family of 3 (4 servings in all) for about $0.80 cents a serving! If you'd like to receive a coupon for $1.00 off to try Campbell's GO soup for yourself, you can participate in a really fun Mad Libs type game entitled Random Text About Last Night! It's pretty neat how it actually comes up in the form of a text message! 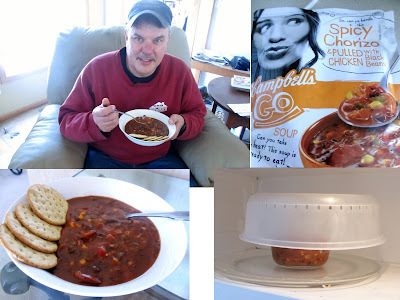 Disclaimer: I received the line of Campbell's GO Soups courtesy of Smiley360.com in order to facilitate this honest review. All opinions expressed above are 100% mine and mine alone unless otherwise stated. Please do your own research before committing to purchase a product or service as your opinions may vary. I've never heard of these before. 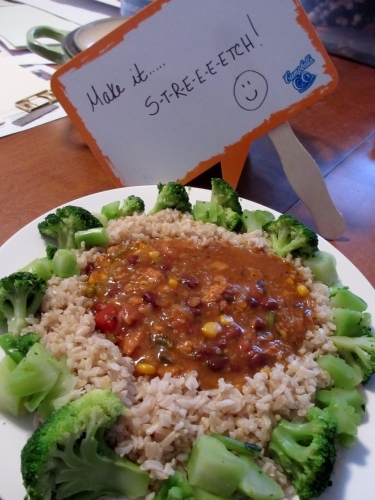 I like your frugal meal idea though, look yummy! I have seen these in the store before but never tryed them . I will have to try them thanks to your review. sorry you've been sick, I missed you! I agreed with you, those heat and serve soups are handy but not that healthy....still better then fast food?? How have I not heard of this before? We love soup, I am going to have to find this. Thanks for the info, it looks yummy! Way ta go, Dad!!! hehehe Baby Girl, you just get so spoiled by everyone don't you! hehehe So Dad loves the soup huh? Well, I think I like your stretch way better than just soup alone! I'm a total broccoli eater especially when it's fresh, and what you put together there looks wonderful! mmmm So what time is supper I'll bring the raspberry tea or would you prefer peach lemonade? ~snicker~ HUGS And great job! Didn't know Campbell's made these! 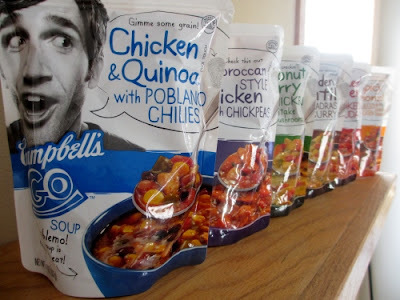 I don't particularly like microwaveable soups but the flavors of these are interesting and different. May have to try one and see how well I like them. Why have I not seen these yet? My pantry is STOCKED with Campbell's soups. I'll definitely try these when I find them.